Grilled Corn with Sweet and Spicy Mustard Compound Butter. I know I know I know. You’re probably thinking that I’ve reeeeeeally gone off the deep end this time. Mustard in butter? Yes. Mustard in butter. It’s a thing. Err, I’m making it a thing. For all of your extra mustard freaks out there like me, this is for you. A new and straight up cahhhrazy way to use it. And for all you mustard haters (like Eddie, whomp whomp), tomorrow, maybe we talk ice cream? So do you think it’s genetic to crave briney and delicious things like mustards and pickles and olives and vinegars? Yes, we always discuss this but in my world I’ve really come across two people: those who go nutso over briney goodness and those that don’t love it. To which I must ask myself: HOW. I mean you are talking to a girl who could come home from middle school and snack on a bowl of olives. And then I would eat cheese slices dipped in mustard. Is this a thing? I kind of like to think of myself as a mustard aficionado. Maybe not that fancy (let’s be real), but there isn’t a mustard I won’t try and I’m pretty sure that making my own mustard was on my (pretend) bucket list this summer? If not, it is now. I’ve been doing some recipe development for French’s and before I even started working with them, I saw that new yellow mustards were going to be released. Sweet AND spicy! Eeeeep. As a strict mustard-only-on-my-hot-dog girl (unless the options include bacon and grilled onions and maybe… cheese), my giddiness was out of control. Then they sent me the mustards. A bit old package of love, filled with French’s Sweet Yellow mustard and French’s Spicy Yellow mustard. It’s like their regular mustard but… better? One has brown sugar for some sweetness, the other has cayenne for some heat. Let me just say that these have been the highlight of our cookouts this summer. I unabashedly packed them to bring on vacation. That went over really well. I knew that I wanted to do something different with the mustards (thought a freakishly toppings-loaded hot dog did cross my mind), and since I’m so basic and can’t stop grilling corn… new herby compound butters were born. For the sweet, we have blue cheese, fresh basil and caramelized shallots. And a drizzle of the French’s sweet mustard. For the spicy, we have bacon, fresh tarragon and roasted garlic. Then a drizzle of French’s spicy mustard. Sweet and heat? I’m so in. Compound butters are something we usually make in the summer since at one point or another, I’m gifted a large amount of fresh herbs from friends and family. But now? I don’t know if I can make another butter without adding a touch of mustard. It adds a slight tang, this wonderful depth of flavor, and the sweet and spicy both totally complement their respective spreads. I’m half tempted to go at it with a spoon but then I remember when I was about six years old and walked into the kitchen to find my brother Will eating a STICK of butter and it sort of scarred me for life. Remember that bacon blue potato salad I made before the 4th? I’ve made a similar one a few times now (because EGGS) and instead of whipping up the vinaigrette for the salad, I’ve stirred in a few tablespoons of the butter when the potatoes were still steamy. OH mah gah. Ridic to another level. I mean, you can even just leave out the eggs and serve this with grilled potatoes as a side dish. Yes? Yes. Two more things! Then I swear I’m done. First, we’ve been making some summer salmon packets to grill. We’ve used zucchini, corn and fresh green beans – and also popped in some cherry tomatoes because they EXPLODE(!) while in the packet on the grill. Kind of obsessed. You gotta try this. Spread some butter on the salmon before grilling and you’re set. And lastly, since Eddie can never get enough steak, we’ve been grilling or pan-searing it. I’ll coat the beef in a crushed porcini rub (a riff off of magic mushroom powder) and once it’s almost finished, slap a dollop of butter on top. Sweet or spicy! That’s why I kind of love it. Both butters work for all the things. And the mustards work for all the things! The sweet and spicy versions are ridiculously versatile now – I’ve already used a dollop of the spicy in my favorite vinaigrette. Plus my mom won’t stop talking about this salad dressing made with classic yellow (have you had that??) so I guess I have to make that too? Annnnd we made another little video for you guys! Just a warning: a ridiculous amount of butter was consumed. Butter coma, commence. Preheat the oven to 350 degrees F. Place the peeled garlic cloves in a square of aluminum foil and wrap them up. Before sealing the foil, cover the cloves with the olive oil. Wrap the foil pack tightly. Roast for 45 to 60 minutes, or until the cloves are caramely. In a large bowl, combine the butter, garlic cloves, mustard, bacon, tarragon salt and pepper. Stir and mash until combined. At this point, you can leave the butter softened so it’s easy for spreading, or you can place it in a square of parchment paper and roll it up tightly, refrigerating it until firm. To caramelized the shallots, heat a skillet over low heat and add the olive oil. Add the shallots with a pinch of salt and stir. Cook for 8 to 10 minutes, stirring often, until golden and caramely. Since shallots are thinner than onions, they can burn easily so watch closely! Stir in the brown sugar and cook for another 5 minutes. In a large bowl, combine the butter, shallots, mustard, blue cheese, basil, salt and pepper. Stir and mash until combined. At this point, you can leave the butter softened so it’s easy for spreading, or you can place it in a square of parchment paper and roll it up tightly, refrigerating it until firm. To grill the corn, rub the ears with the olive oil. Lately, I’ve been grilling my corn without the husks on, tied at the bottom, and without foil, so it takes only a few minutes. 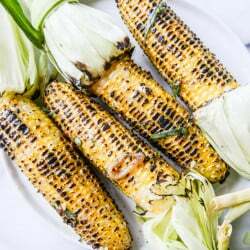 Place the ears on the grill and cook until the corn is golden or charred – whichever you prefer – turning the ears as you go. Remove them from the grill and let cool slightly. Serve with the butter and slather it on! Fresh Pineapple Zucchini Skillet Cake. Our Favorite Grilled Flank Steak Fajitas – Three Ways. I was totally the same as a kid! Still only like mustard on my hot dogs. Sometimes relish, but only if it’s pickled enough! I love the idea of this mustard butter, I had dill butter recently and it was amazing so I’m totally down with butter being flavoured/infused! i could eat grilled corn with just butter and salt. but that sweet compound butter sounds amazing with the caramelized shallots, so maybe not. There are several things I make just as an excuse to eat mustard, so when you say you put mustard in butter, I’m like, hell yeah she did. This sounds amazing. I love grilled corn! These look so good – loving the spicy mustard butter! Any excuse to eat mustard and I’m there. Cheese slices and mustard has happened. Heck, dill pickles and mustard has happened. And these butters (and new mustard flavors!) look amazing. Genius! Mustard lover here! This corn looks perfect! My husband hates mustard, so you know what that means… More compound butter for me! Helllooo heaven! This looks SO good! These really are seriously delish! Where did you get those gorge bowls from? Also, yes, I LOVE mustard: grainy, Dijon, you name it but my husbear cannot stand it. I love mixing grainy mustard in mashed potato. Yum! 1. I’ve grown to like briney things as I’ve gotten older but I’ve always loved honey mustard! that looks SO good! I agree that I think there are vinegar-type people (everyone on my husband’s side of the family!). But I do love a good compound butter. Will try! THANK YOU for validating my cheese in mustard love. My husband thinks I’m nuts. I mean, why wouldn’t you dip them? What’s next, scoffing at pretzels dipped in mustard? Mustard on corn on the cob grilled–must try this camping soon. Looks and sounds amazing! I would have never thought to add those to corn! I often use the brine of pickles or olives as my salad dressing as well. Mustard seriously is one of my top 3 foods. And even though I am a vegan, I will so make this recipe (veganised, like i do with so many of your others, haha).